President Trump’s task force to overhaul the U.S. Postal Service is up and running, and despite concerns that its members would simply follow the direction preset by the tweeter-in-chief, stakeholders in the postal community are impressed with seriousness and attention to detail with which the group has approached its undertaking. The task force, established by an executive order Trump signed in April, has begun holding meetings at the Treasury Department, according to an array of trade organizations, shipping companies and unions. Trump tapped Treasury Secretary Steve Mnuchin, Office of Personnel Management Director Jeff Pon and Office of Management and Budget Director Mick Mulvaney to head up the task force, but their staffers have so far led the charge. Overall, participants in the meetings have come away impressed with the officials’ knowledge base and commitment to learning more about what has caused the Postal Service to find itself in such a shaky financial position. 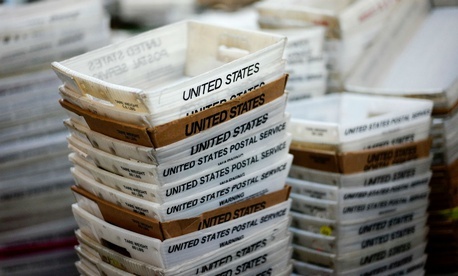 “They were more in the learning mode at that point but had clearly done a fair amount of homework,” said Mike Plunkett, a former USPS vice president for pricing and classification and current president of PostCom, an association of large-scale private sector mailers, who has twice met with the task force. The order came after Trump for months criticized USPS for its contracts with Amazon that he deemed overly friendly to the online retail giant, and some met the announcement with skepticism. Initial reviews, however, suggest that the task force representatives are engaging in open dialogue and conducting an honest search for solutions. The group, made up of Treasury, OMB and OPM officials, has held meetings over the last several weeks. Gary Grippo, Treasury deputy assistant secretary for public finance, and Kipp Kranbuhl, the department’s deputy secretary, have led the charge (both declined, through a spokesman, a request for an interview). They have met both with individual groups in a one-on-one setting and with several groups together. “We were impressed with the level of knowledge that the staff had and the awareness not only of the broad mandate of the task force but the legislative proposals on the table,” said Rafe Morrissey, the vice president for postal affairs at the Greeting Card Association, which met with the task force as part of the Coalition for a 21st Century Postal Service. Morrissey said the task force was focused on long-term solutions, per its mandate, but his coalition stressed the importance of passing more immediate legislation before Congress. Bills in the House and Senate would eliminate the agency’s mandate to prefund future retirees’ health care benefits—lump sum payments on which the Postal Service has defaulted for the last few years—by shifting retirees to Medicare as their primary care provider and amortizing remaining liabilities over the next 40 years. They would provide a permanent boost to USPS prices, potentially reduce the agency’s liability to the Federal Employees Retirement System and allow it to pursue new lines of business. Most postal observers, including key lawmakers, large-scale mailers, employee groups and postal management, believe those steps and others taken in the bill would provide significant, immediate relief to the agency. Morrissey said his group told the task force members they “shouldn’t miss an opportunity” to make such progress. He added while the assumption was the executive order was an outgrowth of Trump’s Amazon-related tweets, the company did not come up at all in the conversation and the discussion was much broader than any one issue. Officials with UPS who attended their own meeting with the task force said they brought up issues related to the Postal Service’s package business, the lack of pricing transparency and the cross-subsidization of the agency’s various business lines. Similar to the takeaways from individuals in other meetings, the officials said the roughly half-dozen task force members were open-minded but kept their cards close to the vest in terms of their own thinking. At no point, however, did they intimate that their findings were predetermined. PostCom’s Plunkett agreed the task force members were not particularly forthcoming but said they “appeared to be receptive” to the issues he was raising. Trump gave the task force four months from the time he issued the order to come up with solutions to put USPS on a better fiscal path, a deadline groups that met with the commission said it is intent on meeting. In his meeting, NALC President Fredric Rolando said he sought to protect the interests of his members and pledged to work with the task force in the weeks ahead. APWU met with the group on Wednesday. Many of the representatives the task force has heard from implored administration officials to leave intact the Postal Service’s universal service mandate. The unions said the prefunding mandate should be eliminated. Large mailers suggested keeping rates affordable while shippers in competition with the agency suggested it was hiding its true costs. The task force, according to the various groups, understands it has a lot of work in front of it and very little time to accomplish it. The stakeholders appreciated the commission's willingness to listen to a variety of perspectives, but after all the meetings, remain unclear about where the administration will come down. “They just took it in and said, ‘Thank you very much,’ ” a UPS official said.